The 2016 MNPG Arch Competition was for the design of a tech port beacon that infuses architecture, technology, ecology and modern living. The Sapphire Coast, Australia, the place for the manifestation, is a splendid locale, that deserves an architecture that can be a projection for continuing expansion, both in development and also for the advancement of humanity. 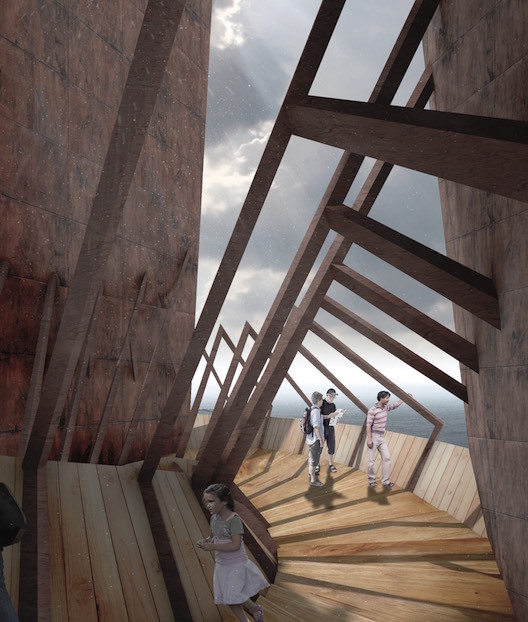 To learn more about the details of the 2016 MNPG Arch Competition, go here. Fraction House is the work of Benjamin Pra and Amandine Graczyk, an expression that supersedes reality, but is cemented in classical appreciations of architecture as well. 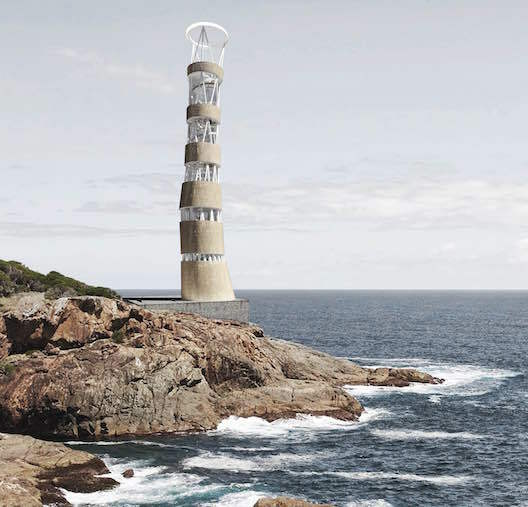 The first thing that becomes apparent, is the movement of the walk and passageways both on the exterior of the landscaping, and also within the journey to the top of the lighthouse. Clean lines from two sides, and a skeleton view from the others. What is most striking about this design is the comfortable weight and colour, and the interdependence of the staircases and the thatching. It may seem difficult to navigate the currents, but the flow seems to just guide the visitor. Almost like a puzzle with all the pieces, that seems to have yet to be finished and done at the same time. Even the light itself is different from the foundation of the beacon. Obtuse, yet refined. Flat panels and swift edges, make this a memorable, yet resonating representation of what it means to execute, exactly what the desire of the architect is, while meeting the requirements of the locality. An international spectacle, that would sure be a token for new understandings within the architectural discipline and also to adjacent sectors. It has the potential to transform the ethos of not just the community, but the rational behind why certain buildings hold meaning, and others eventually don’t. 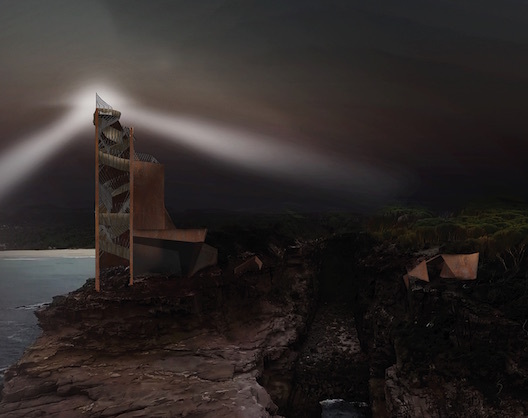 As beacons are rarely actually used for modern maritime usage because of technological improvements, it makes sense that the Fraction Lighthouse does not really appear from the walkway to be a lighthouse, but more of a piano of play that invites the observer to participate. Although from the perspective of the neighboring vicinities, this couldn’t anything else but the lighthouse for the Sapphire Coast. Origins. A lighthouse is originally a signalling device meant to warn ships of danger at sea. Its function dictates verticality in a landscape where the horizon is predominant, thus making it a landmark, a symbol, an identity feature of the surrounding territory, both on land and at sea. Its height offers an exceptional viewpoint on the top, leading us to imagine the lighthouse as a belvedere for visitors as well as a beacon visible from every direction. The Sapphire Coast landscapes are rich, varied, and wild. Where sea and land meet, their natural forces have been battling for ages, breaking the waves and eroding the rocks over and over again, while numerous forms of life (of all shapes and colours) still find ways to thrive in the cracks, under the pebbles, inhabiting the quietest places in the surrounding chaos. We decided to express these natural forces through the architecture of the lighthouse: violence and mildness of natural forces. Genius loci. Tura Head is a mass of land sticking out in the Tasman Sea, offering a panoramic view on the waters and the shores. The chiselled landscape and the wide opening towards the sea allow one to meet and discover the surroundings by various sensory ways: places high enough to spot whales at sea, while lower flat rocks allow one to touch and feel the water, smell the sea spray and the salty air, and hear the crashing and rolling of the waves. On this small headland, the symbolic function of the lighthouse is strong. Tura Head has a special geological feature, a 40m deep, 180m long and 30m high crack on the South side, where the sea penetrates into a singular space that reveals both the violence and the fragility of natural forces (tectonic forces, the eroding power of the waters). At the interface between sea and land we chose to position the lighthouse, surging above the crack as if pushed from the depth of the earth. Natural expression. 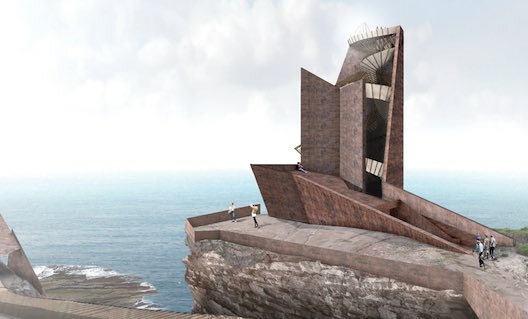 The lighthouse is composed of three plates of reinforced Corten steel, dashing towards the sky at angles as if a greater force below forced them out of the sedimentary rocks. Its rusted and rough surface expresses the salty, eroding nature of the sea as well as it links to the naturally reddish colour of the rocky ground. The intervals between the plates provide space and shelter for human occupations. The first one is sloping to form an overhang, shielding from the wind while still being an outside space. Between the first two plates the space is covered to form a sort of troglodytic space, lit at both ends by wide windows opening to the entrance on one side and the sea on the other, while a crack on the ceiling lets light fall down the rough surface of the wall. Between the last and highest two plates, a wooden stairway made of locally produced timber finds a way to crawl from the ground to the sky, slithering in the crack to culminate in a panoramic platform. The lighthouse is the endpoint of a footpath. The wooden track crosses the site in order to sample the whole range of sensory experiences nature displays, occasionally dilating into wider resting areas. 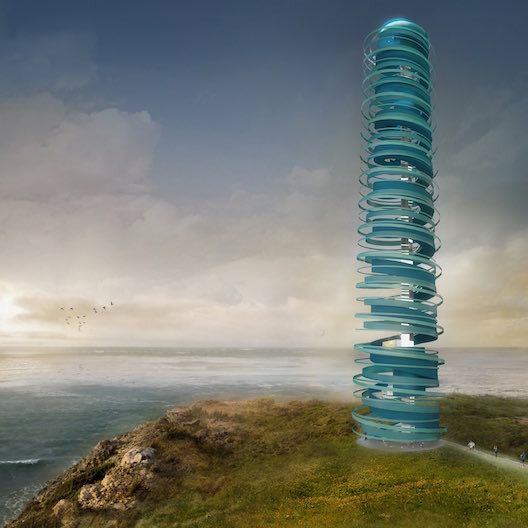 The lighthouse proposes to be an abstract geological element, inspired by locally relevant natural forces. It can be viewed as a continuation of the crack in the ground, with other architectural parts organically developing inside it to reach the light on top. Designed by two architects and ten students, the natural setting is what this is really all about. And then there is a new approach to magnetic levitation light projection from inside the building. A zero cost plan for the transference of the beacon, which acts as the nucleus for further scientific and experimental thought. 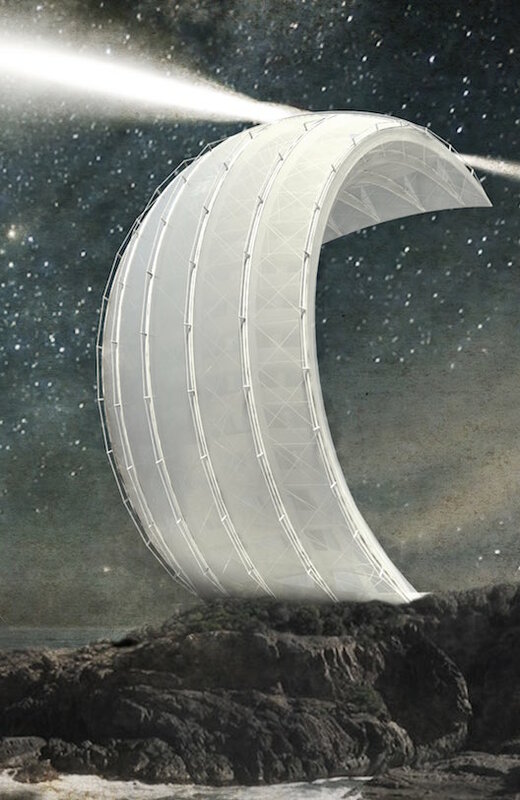 Inventing not just a new way to perceive energy, but also the display of the possibility of architecture as more than a field of design, but that of an arena that can infuse other disciplines to create the next breakthrough. The design appears with its typology of that of a propeller of four ships that are leaving the same port, but in different directions. 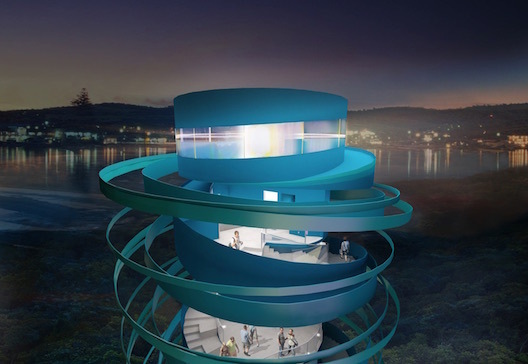 Merimbula’s Lighthouse, engages the visitor to experience its light refraction and material in different stages, depending on the time of the day. A ground floor, two intermediary floors, ten floors and the lighthouse, the spirals that lead up to the top, circumvent each other to create modulation. Almost like a coil or spring, the architecture gives the impression that it could be compressed towards infinity. 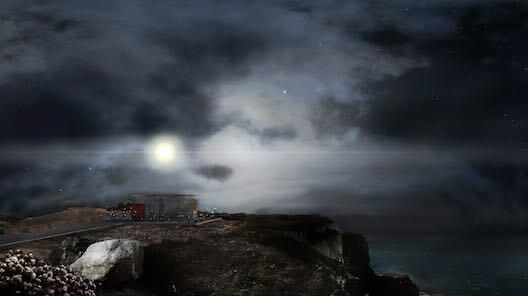 This realist architecture includes a concrete base and then the beacon. Its classic yet unique juxtaposition of new and old, brings out the best in the surrounding area and for visitors far and wide. Conversational motion are also facets of the proposal that encourage discourse about different progressive topics. Most importantly, this is not just about agreement of the physical world, but also debate within the earth’s void. Local ingredients and LED panels help make this provide a memorable parasol effect, with the geology that surround. In a pivotal design that purposefully does not resemble at all a traditional beacon, this circular abstraction delivers. 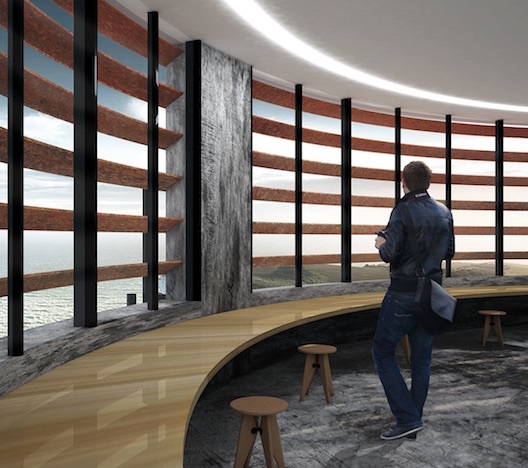 Being primarily being made from wood, the accessible ramps that lead up to the top of the lighthouse serve as a place to learn about the wider geographical area as well as be a part of new experiences within the space. These ramps would be made of a newly introduced material, transparent wood; this vertical communication pathway is the core of what makes the Karla Beacon a representation of what it means to produce quality and be true to new and progressive shapes and sizes. The time for submission for the 2016 competition is approaching. There have been a lot of questions about the location of the proposed tech port beacon. It can be located anywhere within the region of the Sapphire Coast, Australia. There are no coordinates for the build. The place of the structure is up to the architect. Please submit your entry to info@mnpg.net when your entry is ready to go. Winner and honorable mentions are to be awarded a month after the August 31st, midnight, 2016 closing date. Good luck! The competition is in full swing and MNPG Arch would like to offer some guidance as to what a tech port beacon could be. Please keep in mind that this should be a landmark, but also functional for the Sapphire Coast region. Doesn’t have to be atypical, but creativity is of course encouraged. The architect ultimately should have complete expressive control over what the end product is. And remember that as far as the architecture world goes, we want to add continuous innovative value. Thanks again for your interest and happy designing!